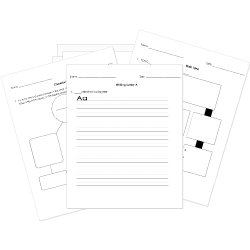 You can create printable tests and worksheets from these Grade 5 Adverbs questions! Select one or more questions using the checkboxes above each question. Then click the add selected questions to a test button before moving to another page. Choose the correct form of the adverb to complete the sentence. She worked (hard) than the student who auditioned before her. Tell whether the adverb in ALL CAPS indicates time, place, or manner. Mr. Wilson searched EVERYWHERE for his briefcase. Students SOMETIMES dismiss from the cafeteria. The ballerina put on her shoes and danced GRACEFULLY. Choose the best adverb to fill in the blank. No one told me to be turn off the TV. Jason said that he did not feel . The witness answered the question . What is the adverb in the sentence? The boy moved slowly across the field. The basketball player dribbled the basketball across the court and scored. Which adverb could be added to tell how the basketball player dribbled the basketball? Choose the correct form of GOOD to complete the sentence. We were prepared for the tornado than the hurricane. What question does the adverb answer? The beautiful ballet dancer danced across the stage. What adverb could be added to tell how the ballet dancer danced across the stage? The lunch lady threw my tray of food at me. Which adverb could be added to tell how the lunch lady threw the tray of food? An adverb is a word that describes a verb or an adjective. An adverb is a word that describes a verb or a noun. What is the adverb in the sentence that answers, how? John swiftly kicked the ball into the net. An adverb is a word that describes a noun or an adjective.